Hi guys, here I'm, I moved the blog again, and will be keeping it here for a while, but the blog 'place' isn't the only thing that is new, so is my new puppy Tyler - Forbes most known as Ty and Tyty, last monday I welcomed this little buddy and since then it's been all fun [and sleepless nights]. he was 40 days on monday, 47 now, and it's amazing how he grew in one week. 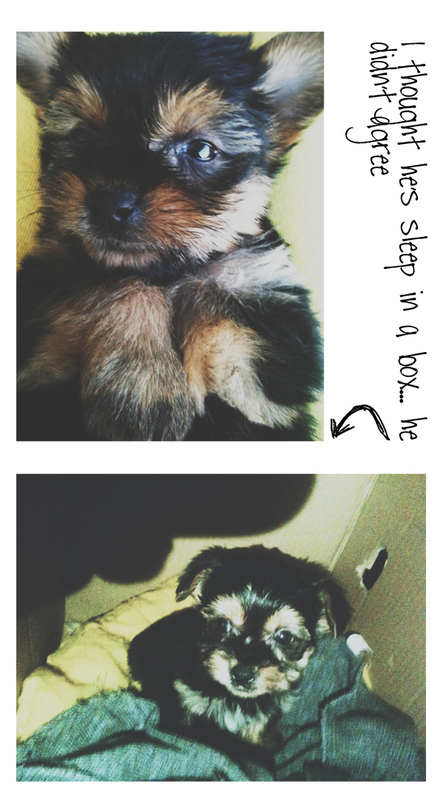 As every new mom to a new puppy I tried to get him to sleep on his own place, I got a box, painted it, wrote his name in it and got a dog-bed matress to him to sleep in, but of course he won't stay in, I left him there for 3 hours and all he did is cry, so I gave up and he's sleeping under my pillow, all happy. I bought him the best puppy food I could find but instead he wants to steal Merlin's food. I try to tell him not to bite stuff but his favorite toy is my socks. I wake up to him biting my nose every morning at 6.
and if you ask me, I'm loving having him around, having a "baby" to watch right now is making my heart happier and Merlin is a little jealous but he plays with little brother once in a while. I hope you enjoy the pics and the little video. [Forgive my bad filming skills and finger on the camera sometimes but it's hard to film with Iphone while chasing him around] .